Known as Gnatia in the ancient times, the ruins of Egnazia are one of the most important archaeological sites of Puglia. 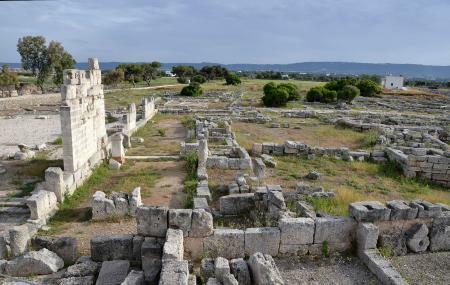 The ruins have a diverse history starting from The Bronze Ages and ending at the Roman Empire before it was destroyed and abandoned completely. The Museum: Hosts the archaeological finds and other historical artefacts from the ruins. Necropolis (right of the museum): The burial ground for a succession of different ages. The Archaeological Park: Demarcated by Messapian walls. Witness the times and lives of many centuries. Enter from the coast Monopoli-Savelletri. Special guided tours are hosted on particular days for the hearing impaired. Check attraction website. First Sunday of the month admissions are free. Check attraction website. Begin with the museum and then move on to the ruins. € 3.00 for Museum and Archeological Park. € 2.00 only Archaeological Park. 50% on ticket prices for age 18-25 years. Up to 18 years of age free admission. How popular is Scavi Di Egnazia - Museo? People normally club together Museo Archeologico Di Egnazia and Scavi D'egnazia while planning their visit to Scavi Di Egnazia - Museo. Much to see. Museum + outdoor museum + underwater museum (extra paid). Worth to visit. A great educational way to spend an afternoon. Between the museum and various interesting finds available, well worth a visit. Need to be able bodied to work the whole site. The most recent find 'melograno tomb' the most interesting as animated by an enthisiastic historian. Always worth that extra mile. Museum needs more information in english for any traveller. I speak and read italian but history can be challenging!! Fascinating archeological site. Very quiet too.